ARTIST:VARIOUS, INCLUDING PRINCE BUSTER, SKATALITES, THE MAYTALS, TOMMY McCOOK, SKA BUSTERS, ERIC MORRIS, DON DRUMMOND. 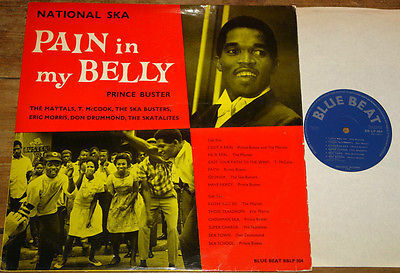 TITLE: "PAIN IN MY BELLY"
LABEL:BLUE BEAT RECORDS BBLP 804. FORMAT:1-DISC, 12-TRACK, MONO,BLACK VINYL, 12-INCH, 33rpm, LP. FIRST PRESS. WITH ORIGINAL INNER SLEEVE. MATRIX NUMBERS:BB 804-1 BB LP 804 2. LABEL DESIGN:ROUGH PAPER LABELS. 'BLUE BEAT' LOGO AT 12 O'CLOCK. SLEEVE DESIGN:SINGLE SLEEVE. LAMINATEDFRONT. FLIPBACK CARDBOARD REAR. SLEEVE CONDITION GRADED ON A 1-10 SCALE:8. LABEL CONDITION GRADED ON A 1-10 SCALE:8. SIDE 1 GRADED ON A 1-10 SCALE:8. SIDE 2 GRADED ON A 1-10 SCALE:8. THE SLEEVE IS IN GREAT CONDITION, WITH ACCEPTABLE, MINOR FAULTS, INCLUDING SOME EDGE AND CORNER WEAR, AND A LITTLE LIGHT CREASING IN PLACES. OVERALL, THE SLEEVE IS IN GREAT CONDITION. BOTH FRONT AND BACK ARE NICELY CLEAN. THERE IS NO WRITING. THERE ARE NO TEARS. ALL FAULTS ARE MINOR, ACCEPTABLE, AND NOTHING TO WORRY ABOUT. THE SPINE IS IN GREAT CONDITION WITHOUT WORRYING FAULTS. ALL OF THE TEXT IS READABLE AND INTACT. ALL OF THE FAULTS ARE MINOR, ACCEPTABLE, AND NOTHING TO WORRY ABOUT TOO MUCH. THE LABELS ARE IN BEAUTIFUL SHAPE WITH ONE OR TWO EXTREMELY LIGHT SPINDLE MARKS. THERE IS NO WRITING. THERE ARE NO TEARS. IF ANY, ALL FAULTS ARE MINOR, ACCEPTABLE, AND NOTHING TO WORRY ABOUT. THEDISC IS IN REALLY NICECONDITION: CLEAN, CRISP AND BRIGHT, RETAINING ITS ORIGINAL SHEEN, WITH A FEW LIGHT SURFACE MARKS, WHICH PRODUCE A FEW SUBTLE BACKGROUND CLICKS ON OCCASION. OVERALL,THE RECORD TESTS EXTREMELY WELL WITHOUT INTERRUPTION DURING PLAYBACK, WITHNO LOSS IN SOUND QUALITYOR AURAL PERFORMANCE, AND NO OBTRUSIVE POPS OR CLICKS. IF ANY, ALL FAULTS ARE MINOR, ACCEPTABLE, AND NOTHING TO WORRY ABOUT. ALL IN ALL, A GREAT PRESSING OF A VERY RARE RECORD AT A VERY NICE PRICE! THIS ONE IS FOR THE COLLECTION, WITH SOME ROOM AND REASON TO UPGRADE THE SLEEVE, BUT NOT WITH ANY URGENCY OR NECESSITY. STRICTLY GRADED USING RECORD COLLECTOR'S GRADING SYSTEM. BID WITH COMPLETE CONFIDENCE AS TOTAL SATISFACTION IS GUARANTEED. UNITED KINGDOM: £7.00 WITH TRACKING. EUROPE: £17.50 (£4.00 EACH ADDITIONAL LP). USA ~ CANADA: £17.50 (£4.00 EACH ADDITIONAL LP). JAPAN~ AUSTRALIA ~ REST OF THE WORLD: £17.50 (£4.00 EACH ADDITIONAL LP). ALL PACKAGES ARE SENT IMMEDIATELY UPON RECEIPT OF PAYMENT. ESTIMATED DELIVERY TIMES: UK: 1-2 DAYS; EUROPE: 3-5 DAYS; REST OF THE WORLD: 7-10 DAYS. I ACCEPT CREDIT/DEBIT CARD PAYMENTS THROUGH PAYPAL. I ACCEPT CHEQUES AND POSTAL ORDERS IN UK £POUNDS STERLING ONLY. I ACCEPT PAYMENT BY DIRECT BANK TRANSFER. I ACCEPT INTERNATIONAL MONEY ORDERS AND INTERNATIONAL POSTAL ORDERS IN UK £POUNDS STERLING ONLY. FOR THOSE ABOUT TO BID - WE SALUTE YOU!